Trax want to see sustainable livelihoods which reduce poverty and increase food security among the most vulnerable in society. We believe this can be achieved while also ensuring environmental sustainability by restoring degraded land, and producing organic, nutritious food which is culturally appropriate. This is why we promote agroecological farming practices. We also want to see the rights of small-holder farmers respected and their knowledge recognised and valued. This is why we promote food sovereignty. We know that our vision of a Ghana without poverty and food insecurity is ambitious. We know that we cannot achieve agroecology and food sovereignty for all Ghanaians alone. This is why we are supporting an alliance of similar organisations, networks, groups, businesses, and individuals across Ghana. Together, we have strength in numbers to achieve our ambitious objectives. 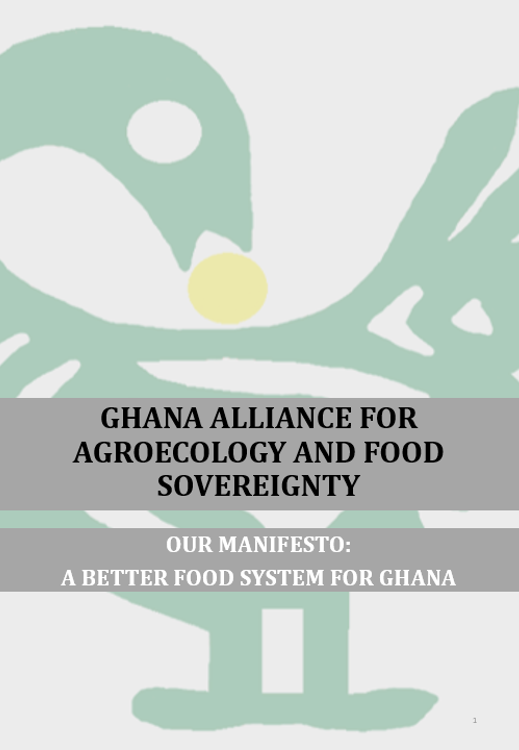 The Ghana Alliance for Agroecology and Food Sovereignty (GAAFS) was officially launched today with the publication of Our Manifesto: A Better Food System for Ghana. GAAFS members want to see a food system which is socially just, culturally sensitive, environmentally sustainable, and economically viable. GAAFS want to see a Ghanaian food system for Ghanaians. Trax is proud to be a lead partner in GAAFS and act as the current secretariat for the Alliance. To see agroecology and food sovereignty promoted across Ghana, we need to work with others who have a similar vision to Trax. As an Alliance we have a stronger voice and a bigger movement for effective change, we have strength in numbers. You can read more about GAAFS on their website or download the Manifesto here: GAAFS Our Manifesto for a Better Food System for Ghana (opens pdf). This entry was posted in Agriculture, Food sovereignty, GAAFS and tagged Agroecology, Food sovereignty, GAAFS, Ghana Alliance for Agroecology and Food Sovereignty, Manifesto. Bookmark the permalink.